With only 12 weeks until Christmas, plans are well underway in the Welsh Capital as the city prepares to embark on a festive season full of magic and merriment. Award winning events, entertainment, attractions and a first-class shopping destination, Cardiff has everything you need to enjoy the most wonderful time of the year. The impressive calendar of events explodes onto the streets on Thursday 9th November, as we herald the official start of the magical season with Step into Christmas. This unique street festival sees the city centre undergo a spectacular transformation with a wealth of Christmassy characters, music, lights and entertainment. Join the merriment and watch some truly magical festive performances in various locations across the city centre. 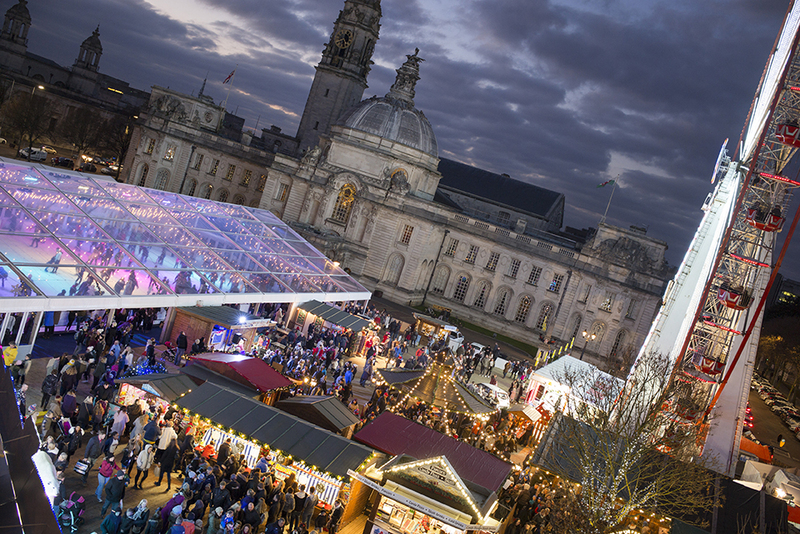 The evening also marks the start of late-night shopping and the opening of Cardiff’s Winter Wonderland with Admiral Ice Rink on City Hall Lawn which runs until 7 January 2018. From 9th November – 23rd December the Festive Quarter arrives, as St John Street, Working Street, The Hayes, Trinity Street and Hills Street become home to over 80 beautifully decorated wooden stalls. Over 200 talented artists, crafts people and food and alcohol producers from across Wales offer an array of gifts such as Welsh slate, crafted candles, tasty cheeses, fruit wines and liqueurs, flavoured vodkas and gins, silver and enamel jewellery, pottery and original artwork. You will be able to find something for everyone on your Christmas gifts list whilst enjoying a cup of hot mulled wine as you browse. Widely acknowledged as one of Europe’s best outdoor ice rinks, thisfirst-class attraction returns to city hall lawn with an even larger rink set under a sparkling starlit roof, meaning skating sessions can take place whatever the weather. Take in the view of the City from the Giant Wheel and enjoy other fairground rides, plus all the food and drink on offer in the authentic Alpine Village and the cosy, atmospheric Bier Keller. This year Cardiff becomes the first outdoor rink in the UK to receive Access Accreditation, allowing even more wheelchair users onto the ice. Cardiff’s number one visitor attraction offers festive fun throughout December. Visitors can expect to see Santa in residence, spectacular surroundings, beautiful decorations, magnificent banquets and wonderful entertainment. Cardiff has fast become top-of-the-shops in recent years and is frequently ranked one of the UK’s top 10 best shopping destinations. Old meets new in the Welsh Capital’s world of retail as modern high street outlets are in walking distance of some of the country’s oldest arcades. St David’s shopping centre is the 9th largest shopping centre in the UK and attracts high street junkies from far and wide. The award winning shopping centre offers a fresh 21st century shopping experience featuring many of the high street’s most popular names across a spacious 1.4million square feet. Home to high street favourites including Apple, Hollister and the biggest John Lewis outside of London, the centre also boasts a five floor flagship Primark as well as the likes of The White Company, Hugo Boss, Karen Millen, Kurt Geiger, Reiss, Jo Malone and Vivian Westwood for the fashionistas who want to splash the cash. Cardiff hosts six historical arcades, dating back to the Victorian era and offering shoppers an alternative to the well-trodden path of the High Street. The Castle Quarter is made up of High Street Arcade, Duke Street Arcade and Castle Arcade, all full of vintage clothes stores, quirky craft shops, legendary jokes shops and trendy coffee shops. Just a short stroll away is the Morgan Quarter made up of The Royal Arcade, Wyndham Arcade and Morgan Arcade which is the oldest of the bunch dating back to 1858. Packed with boutiques, niches stores, shoe shops, jewellery stores and importantly home to Spillers Records, the world’s oldest record shop. The Arcades are a Cardiff institution and a great place to stumble across some of the city’s best independents stores. Cardiff is leading the way in Pop-Up stores as more people spend in these blink-and-you’ll-miss-them outlets here, than anywhere else in the UK. Temporary shops and restaurants are always popping-up in the Welsh Capital ranging from market stalls and street food vendors, to fashion shops, galleries, cafés and bars. Shops such as clothing line Bedroom Athletics and dolly brand Bonnie & Pearl have both been huge pop-up successes in the city. Keep your eyes peeled… if you see it get it, ‘cos they won’t be around for long! Cardiff’s Central Market is worth a visit, a great place to get a taste of the city all under one roof. The impressive Victorian structure offers a unique shopping experience in the heart of a modern, bustling city and you’ll find a wealth of products ranging from fresh baked bread and Welsh Cakes, flowers to records and sweets and hardware to pet supplies and fresh fish. Cardiff Market has been trading in one form or another since the 1700s. It has occupied the same site for over 100 years and although you will no longer find livestock tethered and penned outside its doors, some of the old features remain to this day. On the 9th November we welcome Father Christmas as he takes up residence in a beautiful wooden chalet on Queen Street. Come and hear Rudolph sing and wish Santa and his friendly elves a Merry Christmas, bringing sparkle and wonder to any child’s festive season. When you’re all shopped out why not sit back and enjoy one of our seasonal shows. This year Snow White and the Seven Dwarfs is on the bill at the historical New Theatre. Samantha Womack, Gareth Thomas, Mike Doyle, Chico, Tam Ryan & Stephanie Webber will bring Wales’ No.1 pantomime to life with an abundance of comedy and music, sensational dance numbers, fabulous costumes and stunning scenery. Throw in a magical mirror, seven friendly dwarfs, a beautiful princess, a handsome prince and plenty of audience participation as we outwit the Wicked Queen. Mirror, mirror, on the wall, don’t miss the fairest pantomime of them all! St David’s Hall will host three Christmas Ballets from 19 – 31 December. This breath-taking season from the Russian State Ballet & Orchestra of Siberia starts with Cinderella (19-20 December). The world’s favourite rags to riches fairy-tale is an enchanting mix of Prokofiev’s energetic score, lively choreography and colourful costumes. Then get ready to be swept off to a mysterious place where nothing is quite as it seems in The Nutcracker (21-24 December). Watch with astonishment as toys spring to life, and the treacherous Mouse King battles the handsome Nutcracker Prince. The series climaxes with the greatest romantic ballet of all time, Swan Lake (27-31 December), which features Tchaikovsky’s haunting score. From the majesty of the palace ballroom to moonlit lakes, this compelling tale of tragic romance has it all. For a change of scenery why not finish your visit by wrapping up warm and grab a hot drink in the Norwegian Church. Then take a stroll across the Cardiff Bay Barrage to enjoy panoramic views of the city… just the ticket to blow away the winter cobwebs! Looking for adventure? Take a boat trip to Flat Holm and explore the Island. Or get on your bike and cycle the 10K Bay Trail, part of the All Wales Coast Path. Family entertainment in the Red Dragon Centre, performances including Miss Saigon at Wales Millennium Centre, along with parties in the bars and restaurants at Mermaid Quay, the Bay will be full of festive cheer! For accommodation, Cardiff has plenty to choose from. Whether you are looking for a lavish five star hotel or a cosy boutique B&B, many of the city’s places to stay are a walk from the city centre. Go to www.visitcardiff.com/wheretostay/ for more information.